This is a simplified history, for the full history please look at the ACE documentation. Fixed a bug in NMI handling when triggered from a plugin. Upgraded and optimized plugin API, added Autodoc in SDK (v4 API). Moved Magnum Light Phaser and Trojan Light Phazer emulation from ACE core to plugins. Added plugins for Gun-Stick and West Phaser emulation. Disassembler and memory editor can now be multiple. Added new windows (ASIC interrupt and video registers, advanced controls, user counters). Rearranged some menus, windows and shortcut keys. Fixed all known bugs in memory map display. Updated German catalog (thanks to Stefan 'polluks' Haubenthal). Huge internal changes regarding GUI and AREXX to prepare future features. Altivec is no longer required. Speed optimisation of the emulation (almost 20% faster for Amstrad Plus emulation). Fixes in timings regarding floppy disc and FDC emulation. Fixes in CRTC 4 emulation. Added an option to automatically pause emulation when the main window becomes inactive. Improvements in internal MUI classes. Added an Ambient filetype for AREC files (ACE video recording). Improvements in memory editor and disassembler windows. Added support of assembly file containing a list of EQUs for symbols import (compatible with ACE symbols export, with Pasmo, …). Added an option to be able to provide video recording with a name when driven from AREXX port. Fixed a memory hit introduced with ACE 1.15. Fixed a bug in breakpoints conditions (ASICPageOn token was not working). Added real time video recording. Added symbols support in all windows. Added clipboard support in main window and memory editor. Added advanced search feature in memory editor. Added an option to display image over the visible area of the screen. Added support for new chunks in snapshots (symbols, compressed memory). Improved plugins API for interrupt handling. Added new examples scripts (including one to import symbols from vasm or rasm). Added an option to disabled CPC+ unstable hi-Z emulation. Reworked layout of several windows. Updated german catalog (Stefan 'polluks' Haubenthal). Added new icons for GUI, drawers, plugins and filetypes (Mathieu 'Hwikaa' Delaruelle). Re-optimized emulation speed that had deteriorated in version 1.13 (ACE is now 5% faster). Greatly improved CRTC 0 emulation. Fixed some minor issues in emulation of CRTC 1, 3 and 4. Improved internals to ease portability on AmigaOS and AROS. Added support for breakpoints on Maxam and WinAPE BRK opcodes. Updated the cross-development examples to use vasmz80_oldstyle assembler instead of pasmo. Added new step by step modes in Z80 window. Improved portability and 64-bits compatibility. Fixed minor bugs in MUI code. Fixed minor emulation issues thanks to Kevin Thacker test suite. Migration from gcc 4 to gcc 5. Added new APIs in the plugin interface. Added new plugins for Kempston and AMX mice. Added new plugin for joysticks (replaces internal emulation). Fixed version string of the executable (it prevented Grunch from detecting ACE version). Fixes in tape to hard disc interface. Automatic reconfiguration of the floppy disc drives depending on the inserted disc image. Fixed a bug in ASIC SSCR mask. Fixed mode 2 pixel shift on CPC with CRTC type 4 (AMS40226). Fixed somes issues with video frame buffer management. Added emulation of mixed border/display words bug at screen start when register 6 is set to 0 on CRTC 0 and 2. Added emulation of half-border at end of line on CRTC 0 and 2 (can be seen in OUT(Dated)/Semilanceata). Added a AREXX command to export the current breakpoints in a REXX script. Added support for a new “configurable breakpoints” chunk in saved/loaded snapshots. Added plugin interface so that everybody can add some hardware expansions emulation to ACE (you want emulation for RS232, for VirtualNet96, for PlayCity? Just do it!). Removed built-in printer and Digiblaster support and implemented them as plugins (source code included as an example). Added german catalog thanks to Stefan 'polluks' Haubenthal. Fixed overlay support to avoid an alignment problem that was triggered by MorphOS 3.8 (Stefan Blixth and Charlie). Added audio mono output (internal speaker mixing way). Internal clean up and optimizations. Fixed CRTC 0, 3 and 4 emulation (all demos that were not working as expected are fixed). Finalized Amstrac Plus emulation (no more known problems). New option to automatically reconfigure CPC keyboard depending on host's keyboard. Added new windows for keyboard and joysticks. Added disassembler for DMA instructions. Improved CPC versu host's charset conversion. Fixed minor bugs in MUI interface. Re-introducted automatic experimental frame skipping. Improved rendering engine for future extensions. Improved emulated CPC information window. Fixed catalog version to ease translator work. Improved some internals to ease ports. Added tape emulation through audio files. Added icons and filetypes for Ambient. Added new icons for the drawers and the executable. Added predefined launchers for stock CPC configurations. Reworked preferences menu with new options. 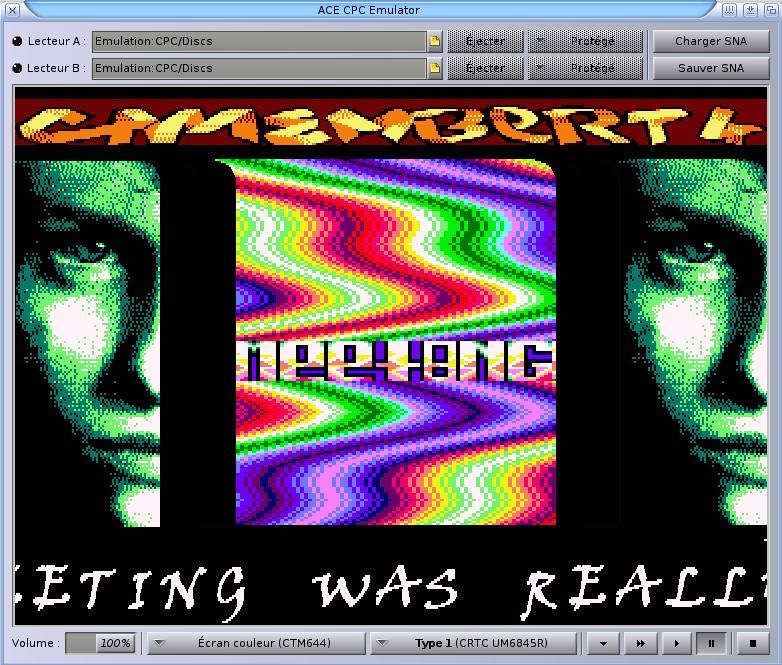 Added new “about” window to know about the currently emulated CPC. Changes in the layout of various windows including the main window. Improved tape to hard disc interface. Improved configurable breakpoints (complex conditions, scripts, names…). Added DK'Tronics memory expansion issues emulation. Added a separate window for emulater screen monitor emulation configuration. Added Amstrad Plus emulation (the entire Amstrad CPC range is now emulated). Added support for light guns (Magnum Light Phaser and Trojan Light Phazer). Added system friendly wrapper to access the hard disc from the operating system of the emulated CPC (benefit of faster than light files accesses, long file names, directories…). Added screen monitor settings to the main window (brightness and vertical hold). Added several new tooltypes and AREXX commands to configure and control the emulator. Improved disc images internal structure to prepare replacement of DSK format. 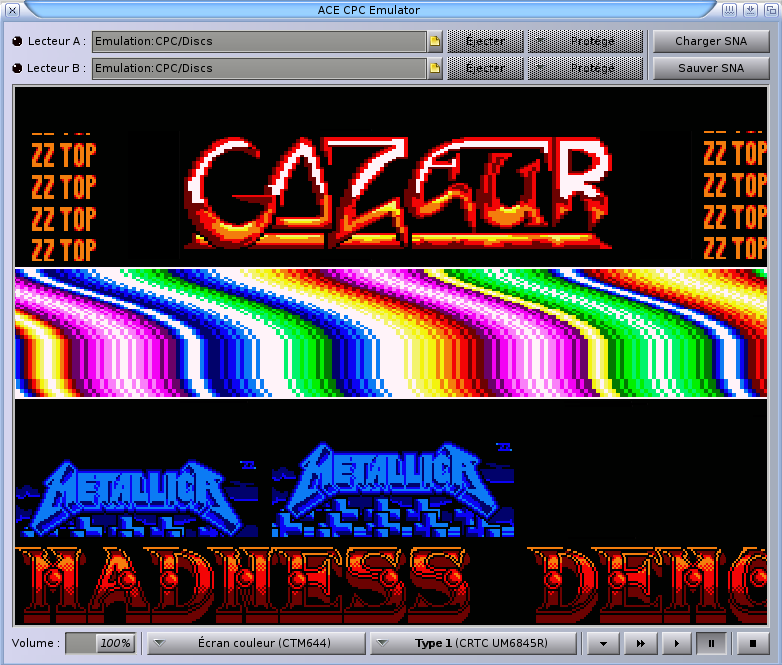 Added emulation of the different Gate Array versions (ACE is the first and only CPC emulator to propose this!). 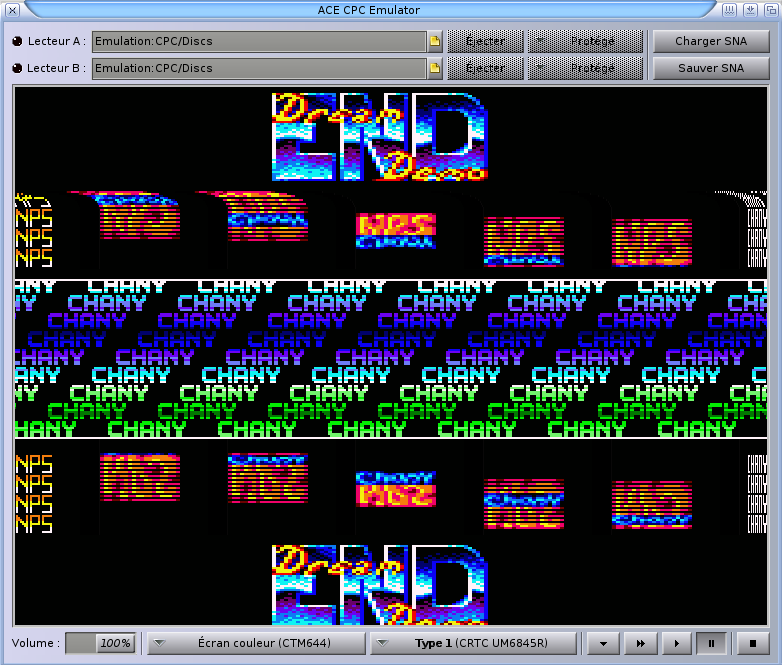 Added a MANUFACTURER option to choose the brand of the CPC to emulate. Fixed the Gate Array analyzer window which could have a wrong size. Added mapping of “ENTER” from the CPC numeric keypad on “F12” (useful for PowerBook G4 keyboard). HexEdit.mcc MUI class is now optional. Fixed some typos in french and english catalogs (RickD). Added synchronisation phase precise display with partial bytes and artefacts support (ACE is the first emulator to do this! Watch… Enjoy… And cry!1)). Improved DSK support (all DSK extensions are now managed). Fixes in Gate Array emulation (Beb). Fixes in CRTC 1 emulation. Fix in I/O port breakpoints management. Migration from gcc 2 to gcc 4. Fixes in CRTC 1 emulation (phi2x). Fix in PSG emulation (phi2x). Improved Gate Array & CRTC emulation and synchronisation. Improved CRTC 0, 2, 3 & 4 emulations. Fixes in English translation (Stefan A. Haubenthal). Fixed to make ACE compatible with MorphOS 1.x (Stefan A. Haubenthal). Fixed a bug in arguments handling that caused a hit (Grzegorz Kraszewski). Fixed a bug in locales handling that caused a hit (Grzegorz Kraszewski).